A-ONE IT is a private, independent data recovery company based in Holmfirth, investing in the latest state of the art technology data recovery systems to bring affordable disk data recovery to all customers. Based in West Yorkshire with clear straight forward fixed pricing of the Data Recovery Services on offer. Our company works to the highest possible standard of work. We do not send disks to other companies to recover the data. Desktop or Notebook drives - either 1.8", 2.5" or 3.5", memory cards, USB flash pen drives. **** No Data No fee. Free diagnostic check of your drive for data recovery purposes only. Windows, Apple MacBook/Imac, Unix and Linux disks recovered. All data recovery work is undertaken strictly to our terms. Warning :- Please don't take your drive to your local Computer Techie Shop. They will not have the equipment to recover your data and ultimately will damage the drive by running "software only"; recovery for days. This will weaken heads and spread bad sectors and or result in the disk becoming non-recoverable. Software only recovery often results in damaged Word or Excel files that won't open, pictures that have marks and stripes on them. You can trust our A-ONE IT to recover deleted files and restore your data quickly and securely. A-ONE IT Ltd can make your data loss an inconvenience, instead of a disaster. It doesn’t matter whether you have lost data on an external data storage device, or a primary storage device, we can perform a disk recovery. On top of that, we can perform a hard disk recovery on your computer or laptop, whether it’s Windows or Mac. A-ONE IT understand the importance of having access to your data and records when you need it, and we’re proud to be a great data recovery company in the UK. A-ONE IT provide disk recovery services to home and business users alike, and we have experience recovering deleted files, family photos, business documents, financial records, and any other kind of data that you can’t live without. A-ONE IT excels at recovering the maximum amount of data so that you can be productive again. Don’t worry about your priceless memories stored on your hard disk. It doesn’t matter how much data you’ve lost, we can handle projects of all size. A-ONE IT can retrieve your personal files from virtually any kind of modern computer data storage device. Once your data is retrieved, we can also transfer it to any new storage devices that we install on your computer. When it comes to retrieving your important information, we’ve got you covered. All data is dealt with in a 100% confidential manner. Compare our pricing to many of the franchise companies on the web charging £650+ and - e.g. PC World £700!. 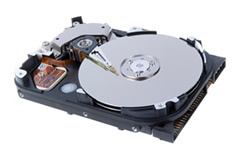 80% of drives received can be recovered using our professional data recovery equipment. Minor head/mechanical problems, bad sectors, stiction and recovery of partitions - are all possible without extra charges. **** Pricing based on disk drives that our Professional Recovery systems can recover data from : PC-3000 and DDI4. (Charges apply for PCB repairs, Clean Room Inspection Services, Donor Headset Transplant service and donor parts). Data recovered has to written to another media e.g. Flash Drive or external hard drive. Customer can provide media.